A lawsuit filed today in the U.S. District Court for the District of Columbia charges that the $60 million sale of the pork industry's "Other White Meat" slogan illegally diverts money to the lobbying efforts of the National Pork Producers Council (NPPC). One of the plaintiffs is Harvey Dillenburg, a pork producer in Adair County, Iowa. Mr. Dillenburg is not a member of the NPPC. He is required by law to pay a portion of every sale to the National Pork Board, which is supposed to use the money for promotions and advertising. The National Pork Board is not allowed to lobby. In 2006, the National Pork Board agreed to pay the NPPC $60 million in return for the property rights to the "Other White Meat" brand. The resulting payments of $3 million per year for 20 years help fund the NPPC's powerful lobbying machine. Think about how this arrangement looks from the point of view of Mr. Dillenburg. Although he does not choose to support the NPPC, the federal government forces him along with all other pork producers to pay the National Pork Board, which in turn pays the NPPC. The other plaintiff is the Humane Society of the United States, a leading animal welfare organization. As the Congressional Research Service (.pdf) explains, the HSUS recently brokered a successful agreement with egg producers, reaching a judicious compromise about what type of cages seem ethically acceptable for hens. Although the leading trade association for egg producers is now working with HSUS to get this balanced policy approved by Congress, the agreement faces implacable opposition from the NPPC. The egg agreement causes no harm to pork producers, but the NPPC is worried that the precedent of a successful egg agreement will generate unrealistic hopes for similar good-faith negotiations about gestation crates for pork. It is not surprising that HSUS has been looking into how the federal government's pork board -- which is not supposed to support lobbying -- helps fund the NPPC's efforts to spoil the egg agreement. This blog, U.S. Food Policy, began covering the tale of the "Other White Meat" sale in a June 2006 blog post, which called for greater transparency about the terms of the sale. When nobody would give me the documents voluntarily, I filed a Freedom of Information Act (FOIA) request. USDA initially turned down my request, arguing that the information was "pre-decisional and deliberative". When I appealed, USDA's Agricultural Marketing Service in December 2006 released partly-blacked out versions of the key documents. Although AMS hid critical details, enough information was revealed in 2006 to suggest that this was a poor use of pork producers' money. For example, I pointed out accounting flaws in the supposedly independent appraisal upon which the $60 million sale price was based. In the HSUS and Dillenburg lawsuit today, I learned for the first time that Mark Williams, who is largely responsible for pulling together the supposedly independent price appraisals, actually has been responsible for developing the "Other White Meat" branding since its inception. Through months of research, The HSUS uncovered glaring legal violations, conflicts of interest, and an exorbitantly over-inflated $60 million price tag associated with the deal. Much of the extraordinarily inflated value of the slogan resulted from 20 years of promotional campaigns funded entirely with pork producers’ own checkoff funds: roughly half a billion dollars. In essence, NPPC charged pork producers twice: once to make The Other White Meat successful, and again to pay for the value of that success. Now, the case against this sale has only gotten stronger. The National Pork Board has largely retired the "Other White Meat" slogan, in favor of the new "Be Inspired" slogan, and yet the pork board continues to pay the NPPC $3 million each year for the nearly worthless old slogan. The NPB has an escape clause allowing it to cancel the payments, but it chooses not to exercise this clause. The HSUS and Dillenburg lawsuit (.pdf) is well written, with astonishing details beyond what can be described in this space. It was covered today in Feedstuffs and other trade publications. 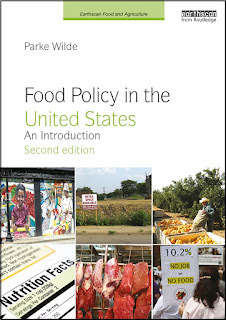 I encourage everybody interested in U.S. Food Policy to read it in full.